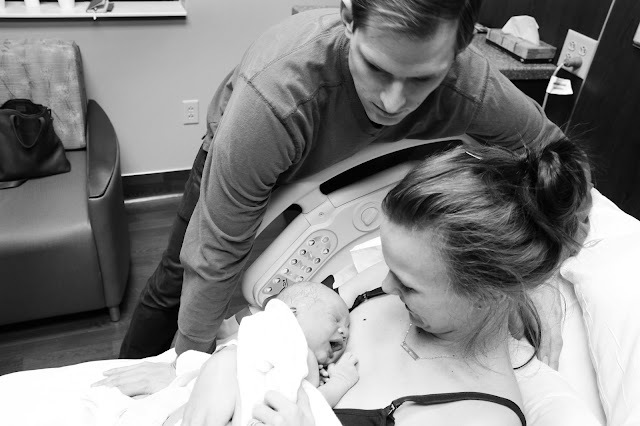 Since it took me twelve pages to write Barrett's entire birth story in my journal, I think it would be a good idea to split this story up into pieces. I'll start with the actual labor and delivery (which is probably the longest part) and save all the other "feely feelies" for another day. Wednesday morning (Feb 17), I went in to the doctor's office at 9:00 AM and got my membranes stripped in hopes it would jump start my labor naturally. It turned out to be more uncomfortable than painful and just made me feel like I had a perma-menstrual cramp, so I got all my stuff together along with a couple of bags for the girls who were driving with Uncle Karl to Grandma Wilson's house for the night while we had our baby! After the girls left, Andrew gave me a blessing, promising me strength and peace throughout the labor, then we headed for the hospital at about 4:00. I started getting nervous in the car on the way over as I started remembering how much going pain-med free hurts. I even started asking myself as I was getting dressed in the hospital gown "Why am I doing this? Why am I subjecting myself to this pain all over again when I've already done it?" But I told myself to stop right there and remember the feelings I felt after I had Alexa. At 4:45, they started the Pitocin. At 4:50, they broke my water. They asked me if I wanted them to check how dilated I was but I said no because I was sure I hadn't progressed much since they checked me that morning at a 3. So, I waited, breathing through each contraction slowly and deeply. 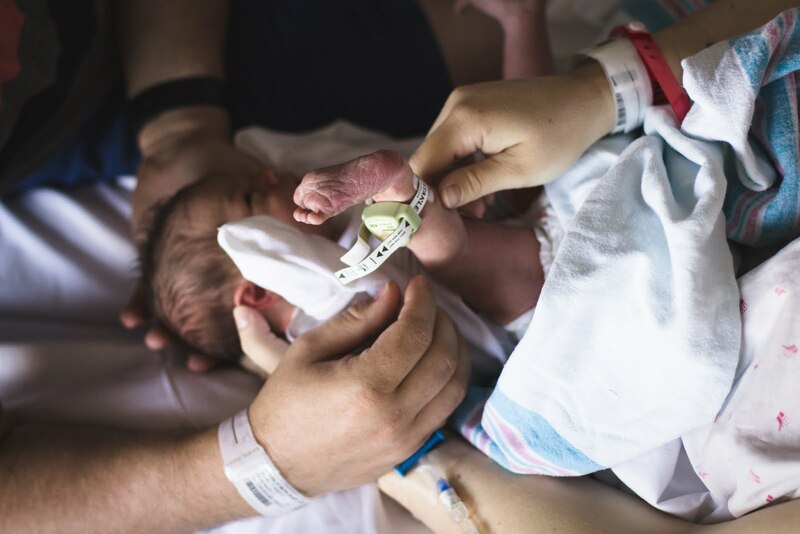 Each time a contraction would come, I counted to 20 as quickly as I could in my head while I inhaled and imagined giving that breath to the baby. While I exhaled, I counted to 20 again as fast as I could and imagined the baby progressing further down into the birth canal. I got this idea from reading bits and pieces of the book Hypno-Birthing and it really helped! 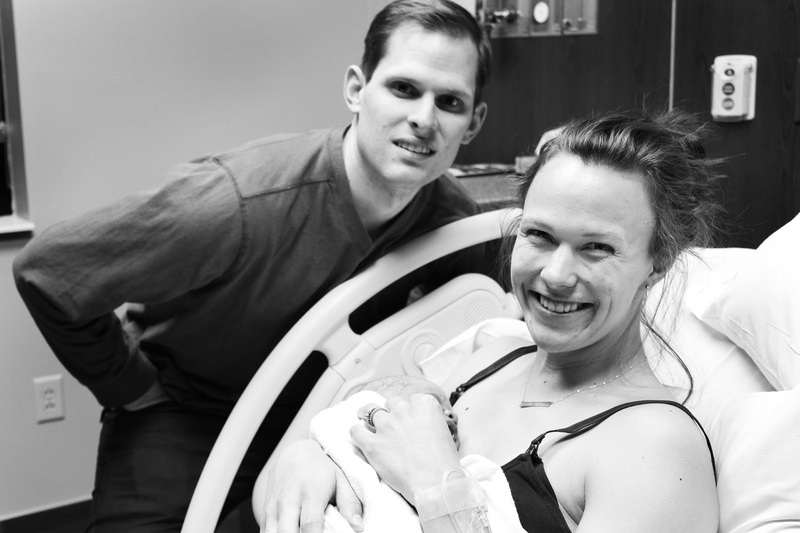 At 5:40, the contractions were steadily becoming more painful, but not unmanageable. At 5:52, the nurse asked me if I'd like her to turn the Pitocin up a notch. I agreed because I really wanted to get this labor moving and get my baby in my arms as quickly and as safely as I could! At about 6:35, I practically forced Andrew to leave and get himself some dinner from McDonalds down the street because I'd rather have him leave now when I was still a ways off from delivery than have him pass out from hunger when it really counted. He grudgingly left me to get some dinner with a kiss and a promise to be back as quick as he could. At 6:45 while Andrew was away, my nurse checked me and I was dilated to a 6.5 cm. I texted Andrew to tell him the news. He didn't take much longer to eat and shortly after he got back, my nurse came in again and told me to let her know when I could feel constant pressure down low so that we could get Dr. Boheen there in time. That time came at about 7:30. My contractions were getting pretty painful at this point. Suddenly I wasn't quite as calm with my breathing. Instead of counting all the way up to 20, I was only getting to 12, maybe 14 before I had to exhale. I'm not sure how quickly I exhaled because the exhales had turned into moans of pain. You could probably gage the severity of the contraction by my moaning. Haha! But I still tried really hard to focus on giving my breath to the baby and moving him down lower as I exhaled. Focusing on this instead of the pain helped. My left hand started tingling first, followed by my right hand, my feet, and then even up into my neck and face. I always forget that my body starts tingling during labor. Up to this point Andrew's main job was to help me relax and focus which ended up being sitting quietly and reading a book or texting people with updates. Haha! But as soon as I started moaning, he was up, right by my side, holding my hand letting me squeeze the life out of his hand, massage my shoulders, put a cold hand on my head, say encouraging words, whatever helped. I definitely couldn't have done this without him. 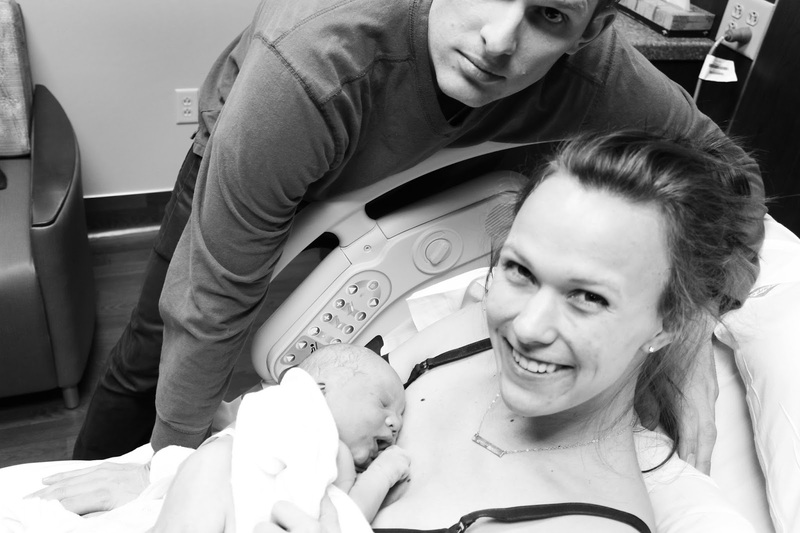 Dr. Boheen arrived sometime after 7:30, probably about 7:50 and waited for me to be ready to deliver my baby! The contractions were so painful at this point and I could really feel his head coming down, but not enough to push yet. I kept telling everyone that I needed a coach, someone to tell me when to push, but they kept telling me, "You've done this before. You'll know. You can do this." Between contractions I would try to communicate things like needing a coach, but I was also saying things like, "I just want him out. Can I push now? Is it alright to push? I just want him out." I was trying so hard to remember my breathing and helping the baby come down, but man. It. Was. Painful. What's crazy is how quickly things move and how intense it all gets the moment you feel that urge to push, and it's hard to describe how I knew it was time to push. I don't know if it was just that I could feel him in the right position or what, but I just started pushing because I just had to. That's when I started yelling. I can't imagine not yelling. Andrew told me over and over again to breathe, so did the nurse, and everyone was telling me to keep pushing. I could feel the burn as his head began to crown. It hurt and I wanted to stop pushing, but I knew I couldn't. The only way out of this pain was through, so I decided to push through with all my might and pray that I would be strong enough to end the pain and get my baby into my arms. The first "pushing contraction" ended and I felt such relief! I took deep breaths and relished the relief before I would have to push again. The next contraction came and I pushed and yelled with everything I had in me! That's when I felt his head come out. Dr. Boheen told me to open my eyes and I saw my baby for the first time, but I knew I wasn't done yet. I pushed one last MIGHTY PUSH! And my beautiful baby was out and in my arms! Throughout the labor, I wondered if I would have the same "runner's high" at the end that I had with Alexa or if I would just feel tired. It's amazing how even though I had just worked harder and exerted more effort than ever, I was practically jumping up and down cheering! "Look at my baby! Here he is! I have my baby! He's here! He's so beautiful! I did it! He's out! Oh, I love you!" 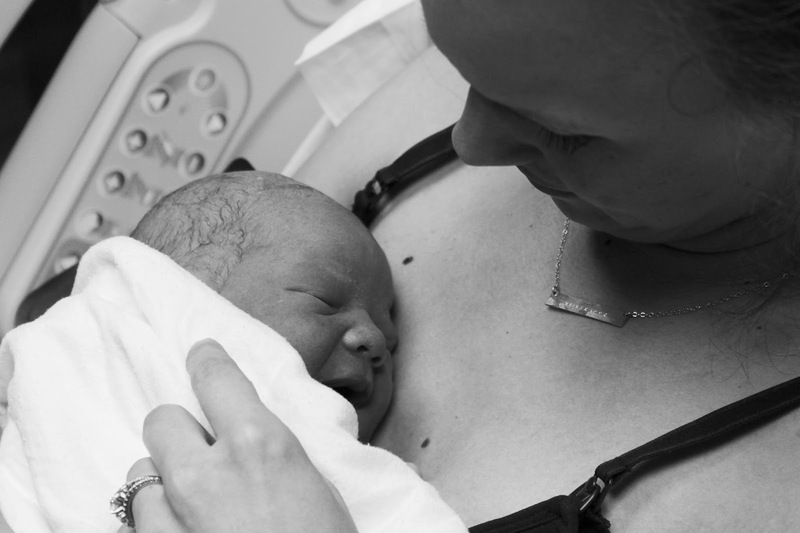 I held my baby against my skin and relished the feelings of relief, accomplishment, and victory. He was here and we were together! He, Andrew, and I had worked as a team and we were all together at 8:03 PM. This, this feeling that I get when it's all over is why I choose to go naturally. My sis-in-law who has made it a sort of tradition to arrive within 10 minutes of my baby's births was on scene and took a few pictures for us. I cherish these photos that capture one of the greatest moments of my life. So, from start to finish? 3.25 hours. W-O-W. Short labor... that's the way to go.